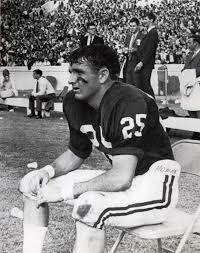 For Dennis Homan, It's About The "Four F's"
Dennis Homan pictured during his playing days at Alabama. Muscle Shoals, Ala. – The field at Muscle Shoals High School bears his name. The first player from Muscle Shoals to be drafted in the NFL, Homan was an exceptional all-around athlete. After graduating from Muscle Shoals High School, Homan went on to play for Paul “Bear” Bryant and the Alabama Crimson Tide. In the days when Homan played for the Tide, freshmen did not get to play. As a freshman in 1964, Homan said, “We got beat around by the seniors to help them win the national championship.” Homan’s freshman year, Joe Namath was under center for the Tide. Waiting in the wings was Homan’s roommate, Kenny Stabler. When asked about staying out of trouble with Stabler, Homan jokingly said, “I tried my best with Kenny, that’s for sure!” As a player, Homan originally came in as a running back, but became a two year starter at split end. On the other side of the field was another great receiver in Ray Perkins. As for Coach Paul “Bear” Bryant, Homan said, “That was a man I feared more than any man in my life. A lot of our motivation was out of fear. We lost three games in four years and I remember the price we paid after each loss.” As a matter of fact, Homan said that before his senior year, he and his, now, wife of 48 years wanted to get married, but Homan said, “Coach Bryant put a squash on that.” Taking Coach Bryant’s advice, they waited until after his senior year to get married. In his time under Coach Bryant’s guidance, Homan was a two time SEC performer and was also named an All-American and Academic All-American his senior year, after making 54 receptions for 820 yards and nine touchdowns. The Tide won the national championship in 1965 and was undefeated in 1966. After Alabama defeated Nebraska 34-7 in the 1967 Sugar Bowl and Vince Lombardi and the Green Bay Packers went on to defeat the Kansas City Chiefs in Super Bowl I, Coach Lombardi was asked how it felt to be the best team in the world. His response was, “I don’t know, we haven’t played Alabama yet”. In the Senior Bowl, Homan was named the MVP of the South team. In 1968, Homan was selected in the first round draft by the Dallas Cowboys. Of his time in Dallas, Homan said, “I tried my best and did everything I could do”. His 1969 season with the Cowboys was his most productive on the field with 12 catches and 240 yards. While Homan was in Dallas, another familar Alabama name, Lee Roy Jordan, was there as well. Homan said, “Lee Roy was a great friend in Dallas and took me under his wing. He showed me what I needed to do and what I didn’t need to do.” Homan went on to say, “It was great having someone out there who came from the same place I came from. Lee Roy Jordan and his wife were good to both Charlotte and I.” On his years of playing football, and his life in general, Homan said, “The Lord has blessed me”. He went on to say that he wouldn’t take anything for the relationships made at Alabama, Dallas, and the Kansas City Chiefs. For his success on the field Homan was inducted into the Alabama Sports Hall of Fame in 1999. On or off the field, Homan said that he lives by the “Four F’s”. They are faith, family, friends, and football (in that order). Being able to use his success as a platform to share his faith is important to him. He said, “I’ll be stopped by someone in a store and it gives me an opportunity to share my faith with them.” Looking back, Homan said, “I wouldn’t change my life. I don’t believe I could’ve planned it any better. I’ve got the most beautiful wife, I’ve got a beautiful daughter, and I have a great son. When talking about the grandchildren, Homan said that they are all great athletes as well, but they don’t have to play sports to make him happy. In 2015, Homan’s wife, Charlotte, was included in Bill Norvell’s book “Inspiration From Anytown, USA.” Appropriately, her story was placed in chapter 25 of Norvell’s book which was Homan’s football number. As for his thoughts on Coach Nick Saban and what he’s done at Alabama, Homan said, “He has a great philosophy in what he’s doing. He’s bringing in great players and teaching them what it takes to win.” Having been coached by Coach Paul “Bear” Bryant himself, Homan is certainly no stranger to coaches who know how to win. Speaking of people who know how to win, it was Coach Paul “Bear” Bryant who famously said, “I ain’t never been nothin’ but a winner”. Well, Mr. Dennis Homan is among those winners. You can “Mark It Down”. Florence, Ala. – Born on September 2, 1935 in Limestone County, Alabama, to Walter Guy and Evelyn Hillis Daniel, Carrel Daniel was an outstanding athlete at Athens High School where he played football, baseball, and ran track. 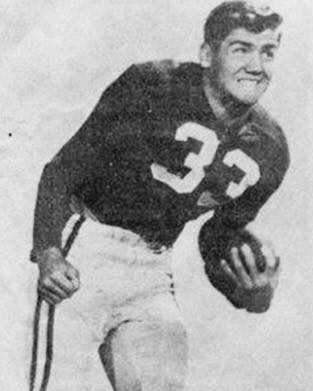 A 1954 graduate of Athens High School, Daniel was recruited by Alabama Head Football Coach Harold Drew and committed to playing for the Crimson Tide. Shortly into Daniel’s playing career at Alabama, J.B. ‘Ears’ Whitworth took over the program. Under Coach Whitworth, times were difficult. With the coaching situation at Alabama, Daniel, along with many other players, chose to transfer. In 1955, just one year after Harlon Hill was drafted to the Chicago Bears from Florence State, Daniel joined the Florence State (UNA) football program. At Florence State, he would play under legendary football coach Hal Self. His senior year, Daniel was selected captain of the football team. In 1958, Daniel graduated from UNA with a degree in Business Administration. For 35 years, he was the owner of the famous Dale’s Restaurant which was located in Florence, Alabama. In 2014, Daniel’s was honored by being inducted into the Limestone County Sports Hall of Fame. During his induction, several friends and teammates had praise for Daniel and his playing career. One of those was fellow Athens High School teammate and Alabama football player, Baxter Booth. Booth said of Daniel, “He was about 180 pounds, which was pretty good size back then for a running back. He could tackle, block; really do it all. We had some good teams back then and he was a big reason.” Another fellow teammate, David Martin, said, “Not only was he a good player and get a yard every time you needed it, but he was an even better person.” On Friday, December 16th, Daniel passed away at his residence. According to Elkins Funeral Home, a celebration of Mr. Daniel’s life will be announced at a later date. Daniel was a booster/supporter of the UNA Lions throughout the years until his recent retirement, illness, and death. Donnie Johns with his granddaughter, Harper. Elkmont, Ala. – At a very young age, we all ask ourselves the question, “What do I want to be when I grow up?” As we grow, there are many circumstances that lead us to our decision. In the early 1970’s, Donnie Johns was attending Elkmont High School and playing football as a halfback for the Red Devils. His father, Cedric Johns, was a lieutenant with the Athens Police Department, so law enforcement was in Donnie’s blood. After graduating high school in 1974, Johns didn’t find himself in law enforcement, but digging ditches, by hand, for Burgreen. It didn’t take long before he knew he wanted to do something else. Johns was hired by Athens Fire Department and would work there for two years before being hired by the Athens Police Department. Along with his friend and fellow officer, Jerry Crabtree, Johns was sent to Jacksonville, Alabama, for the police academy. 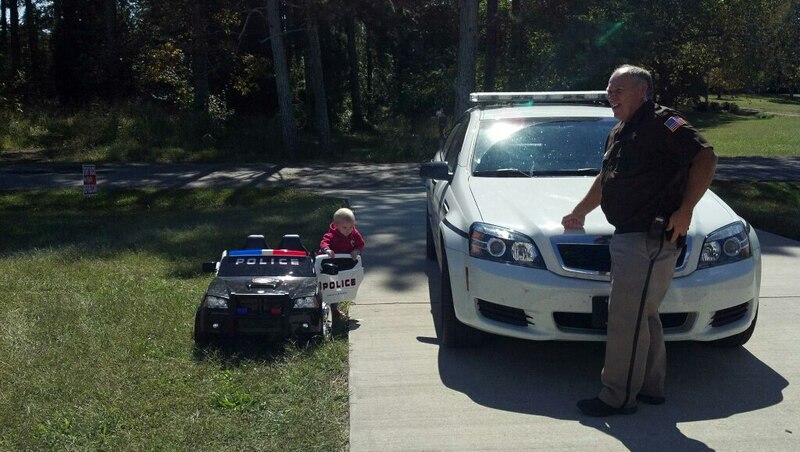 He would serve the City of Athens for eight years as a police officer before taking short-term jobs with Steelcase and Saginaw. Johns says that one man he worked with made the comment that his kids were grown up and it was difficult to be there with them as they grew up. With thoughts like that in mind, Johns took a job with Athens Utilities and worked there for the next 17 years. Looking back, Johns says, “I may have never made much money, but I didn’t miss out on the things that Coty and Amanda (Johns’ children) did”. In 2004, Johns found himself back in law enforcement when an opening became available with the Elkmont Police Department. 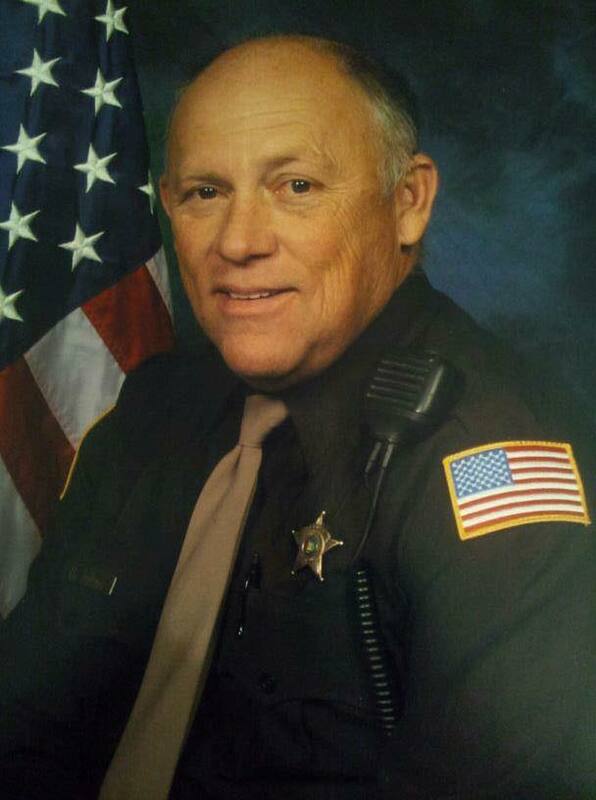 While serving at Elkmont, Johns also worked with the Limestone Sheriff’s Department, serving there for a decade. Today, Johns still serves the citizens of Elkmont as a police officer and works part-time at Athens State University as a security officer. As for the family, in March, Johns will be celebrating 42 years of marriage with his high school sweetheart, Vickie. His children, Coty and Amanda, are grown and they now have families of their own. Johns says they get to spend a lot of time enjoying the grand kids. The majority of Johns’ career has been spent serving his community while making time for his family. As a final piece of advice, Johns says, “you’ll never regret the time spent with family”. You can “Mark It Down”. 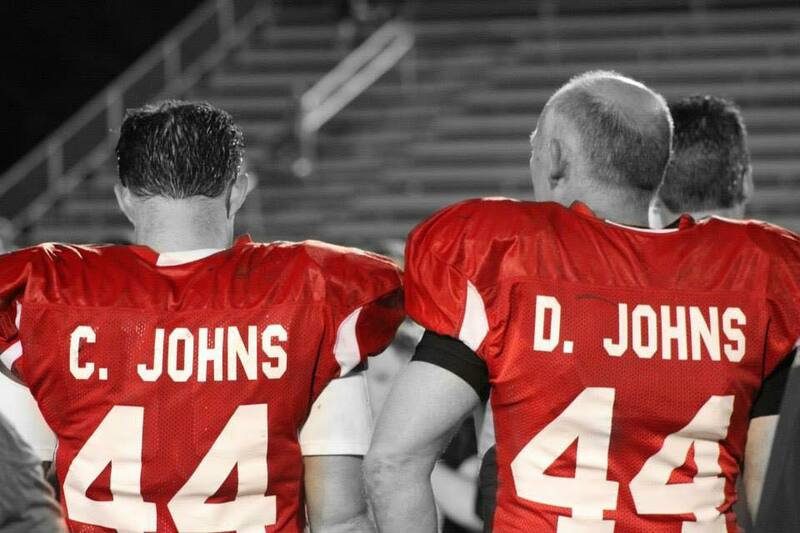 Donnie and son Coty playing together in an Elkmont alumni football game in 2014. Anderson, Ala. – One turn off of Highway 99 and onto Persimmon Tree Road in Limestone County will lead you to Sherrill Family Farms. On their 13 acre farm, owners Justin and Lindsey Sherrill raise multiple breeds of pigs including: Red Waddle, Yorkshire/Hamshire crosses and Berkshire. As for a background in farming, Justin had been raising goats and chickens the last four years and Lindsey’s family had raised cattle and goats and she helped her family on their farm growing up. Lindsey said they bought their first piglet in 2015 and now have 44 pigs of all ages. When asked what led them down the path to pigs, Lindsey said, “we started raising hogs mainly to give people a healthy option for pork at an affordable price. We believe families have gotten away from the simple life, which is easy to do as fast paced as life is for people now…work, kids, church, ballgames, etc. 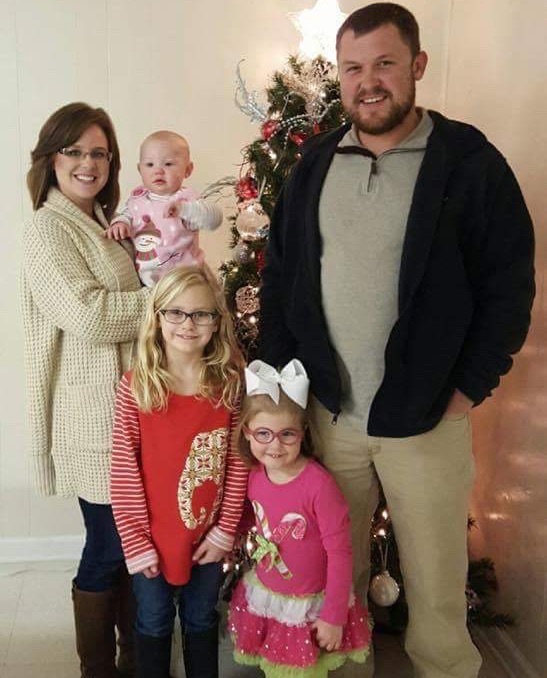 God has blessed our family in so many ways and we want to give back any way we can and make a little money too.” Sherrill Family Farms offers state inspected an non-GMO sausage, pork steaks, pork ribs, and pork chops. You can follow Sherrill Family Farms on Facebook @SherrillFamilyFarms and message them your order or call them at 256-777-4177. From firsthand experience, my family can tell you, the sausage, pork steaks, and pork chops are delicious! You can “Mark It Down”! Athens, Ala. – Suzanne Schrimsher says it all began in the home economics room as a student at Athens Bible School. Suzanne said, “Mike Ogles and other boys in class would come in our home economics room and eat whatever we had made for class. Way back then we talked about a bakery.” Fast forward 20 years. Suzanne had just lost her job and was in the middle of a divorce when her old classmate, Mike Ogles, asked her if she’d like to open the bakery that they had talked about in high school. 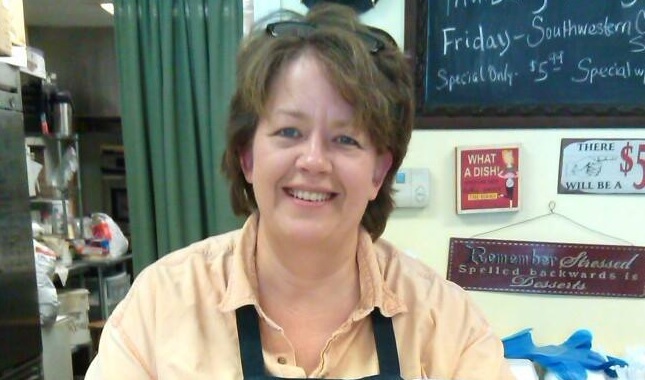 With the help of her friends, Mike and Nikki Ogles, Suzanne’s Bakery & Eatery opened on October 17, 2005. Suzanne says because of her friends, she has been able to live out her dream. Initially, Mike and Nikki were able to be around the bakery, but other commitments have taken them away from the store. Another friend, DeeDee Butler, jumped in and partnered with Suzanne. Suzanne says that she and DeeDee raised their children together and have known each other for more years than she wants to think about. Suzanne’s Bakery & Eatery is no stranger to community efforts either. The business has supported Sydney’s Coins for Courage, Eli’s Block Party Childhood Cancer Foundation, Van for Laura, and others. Her business was started through friends and she has continued to be a friend to the community. What about the food? Suzanne’s Bakery & Eatery offers a myriad of baked goods. With fresh breads, cakes, pies, cookies, casseroles, sandwiches, and a variation of salads, you’re sure to find something you and your family will enjoy. When you walk into Suzanne’s Bakery & Eatery, you’re greeted by a friendly face (which may or may not have flour on it). It just means they’re working. Suzanne’s Bakery & Eatery is open Tuesday 10am-6pm, Wednesday 10am-5:30pm, Thursday & Friday 6:30am-6pm, and Saturday for bakery pickups only. You can check out many of Suzanne’s tasty treats on Facebook at @SuzannesBakeryInAthens. Suzanne’s Bakery & Eatery is located on 1207 Forrest St in Athens, Alabama. They can be reached by phone at (256) 232-8210. Whatever you’re in the mood for, at Suzanne’s Bakery & Eatery, you can’t go wrong. You can “Mark It Down”!